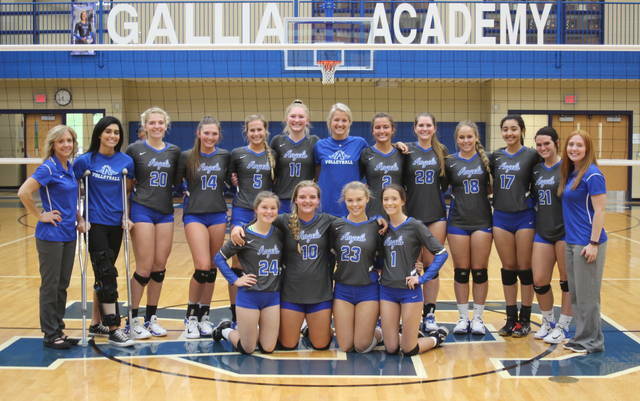 The second-seeded Gallia Academy volleyball team earned its third straight Division II sectional title on Saturday in Gallia County, defeating third-seeded Athens by a 3-1 final. GAHS (23-1) won the first game by a 25-21 margin, but the Lady Bulldogs (18-6) won the second by a 25-22 count. The Blue Angels earned their own 25-22 win in the third game, and then sealed the match with a 25-18 win in the fourth. Gallia Academy will have a chance to avenge its only setback of the season against top-seeded Logan Elm in Wednesday’s district semifinal at Southeastern High School. A complete recap of the Blue Angels’ sectional championship victory will be available in Tuesday’s edition of the Gallipolis Daily Tribune.